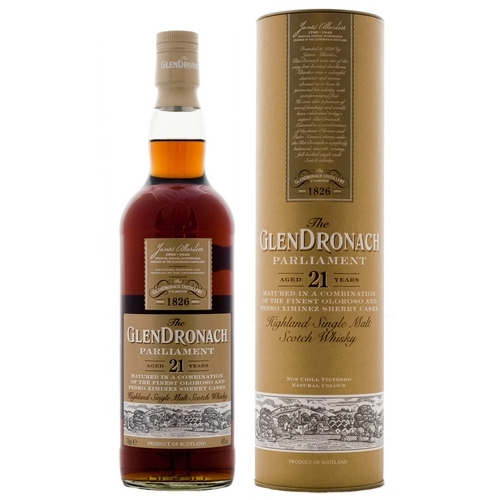 The Glendronach distillery is located near Forgue, in the Scottish Highland whisky district. Glendronach was founded in 1826 and is currently owned by BenRiach. Glendronach is known for its wine cask finishes, which often result in a very prominent sherry flavour. Obstkorb Deluxe + perfekt eingebundener Eichencharakter. Noch nicht zu bitter. Sehr nah an der Perfektion. Mouth: Sherry, spice, orange, drying, cinnamon, delicious. Sherry, sherry, sherry with dry and rather short finish. After trying Allardice 18, and hearing Parliament 21 was even more intense on the sherry I was very eager to try it. Although I probably wont buy a bottle due to the price. If today I was to favor one sherry whisky this would be it. If Allardice is really good, this is amazing. I absolutely love the sherry intensity. Score would be higher if it was more affordable. Very subtle and understated up until the finish where the oaky pepper kick abounds. Feels somewhat imbalanced and forgettable. Very quick to evaporate. Soft smoke, apple peel, earthy walnut. Quite subtle aromas. Tangy oak notes, a very subtle sweetness & fruitiness. Pepper hits suddenly and overpowers the previous subtleties. Wahnsinnig starker Sherrygeruch. Eine richtige Sherrybombe, aber hält nicht was er verspricht; weder im Geschmack noch im Abgang. Bin enttäuscht- kein schlechter Whisky , für mich aber total überbewertet. Sherry overdose! The Sherry influence dominates the nose. Very fruity with raisins, plums and oranges and a bit of oak and leather in there as well. Flavors on the palate are bursting with Sherry dominance; dark chocolate, orange, plums, and cinnamon. Noticeable tannins on the aftertaste. Surprisingly long sweet finish that is smooth and burn free. The 12 and 18 are wonderfully Sherry, but this offering, you can definitely overdose on the Sherry! Superb if you enjoy heavily Sherried whisky and great even if you don't. schön in der Farbe. ölig im Glas. blumiger Geruch. toller Abgang. Complex and full body, we'll worth sherry dram if you can find it, I have 2 bottles says it all! Masterpiece! Like the 18 year old Allardice, but even better. If you like sherry whiskies and want to get something special, get this one. Strong sherry flavors give this whisky a sweetness and delicacy that is very nice on the tongue. Amazing dessert whisky. The sherry casks is not overpowering, but still gives the whieky the right amount of sweetness to go well with chocolate, ice-cream or cake. Also by itslef super nice and well balanced.